GONAIVES, Haiti (CNN) -- Four major storms have raked the desperately poor country of Haiti in the past month, leaving at least 341 people dead. 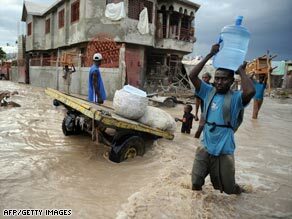 A man carries drinking water through the flooded streets of Gonaives, Haiti, on Monday. Nine of the deaths were attributed to Fay, 79 to Gustav, 183 to Hanna and 70 to Ike, said Abel Nazaire, deputy head of Haiti's Civil Protection Service. The country's fragile infrastructure was overloaded after the storms and officials were concerned that the floodwaters could spread disease, Sophie Boutaud de la Combe, a spokeswoman for the United Nations Stabilization Mission in Haiti, said Tuesday. Gonaives, on the west coast, is one of the hardest-hit cities. This week, Gonaives was knee-deep in filthy water and reachable only by water or air, with many of Haiti's bridges destroyed and roads flooded. Another survivor said, "The flood washed away everything. I couldn't save anything. They should just move this city. Floods always destroy it." Aid workers warned of a deepening humanitarian crisis as attempts to deliver aid were frustrated by logistical problems. The U.S. Navy's USS Kearsarge arrived in the waters off Haiti on Monday to support the U.S. Agency for International Development's efforts to assist after the devastation. The vessel will help move cargo and equipment between affected cities and will deliver relief supplies, said the U.S. Naval Forces Southern Command. But Monday, the Kearsarge wasn't able to deliver anything to Gonaives, because the ship's scout helicopters couldn't find a suitable place for supplies to be unloaded, according to The Associated Press. A U.S. Coast Guard ship carrying 35 tons of relief supplies arrived Saturday in Gonaives. The U.S. cutter was preceded by a ship carrying U.N. relief supplies, including 19 tons of high-energy biscuits, 50,000 bottles of water and water purification tablets, which arrived Friday in Gonaives, said Myrta Kaulard of the United Nations' World Food Program. Hundreds of people had taken shelter in a school. They told Penhaul they had not received relief aid in a week. An official in Gonaives told the AP on Monday that nine people had died in shelters, including two children. It was not clear if they had died of starvation or some other cause, Daniel Dupiton of the region's civil protection department told the AP. When floodwaters were at their highest, some residents camped out on their roofs, their clothing and blankets hung over the sides of buildings. Some people "have lost really everything. ... These are not rich people, these are people who were really struggling [already] against high food prices," Kaulard said. U.S. Navy Capt. Frank Ponds said he had flown over part of southern and northern Haiti. "I saw towns that were completely flooded," Ponds said. "I saw infrastructure, such as bridge[s] and roads, totally wiped out." The eye of Hurricane Ike never touched Haiti earlier this week, but the storm system did bring heavy rains and winds to Gonaives and other towns. Jean Pierre Guiteau, executive director for the Red Cross in Haiti, said 52 people were killed when a river burst its banks in the mountain town of Cabaret near the capital, Port-au-Prince. Another 21 bodies were pulled from sea at Fort-Liberté, Haiti, close to the border with the Dominican Republic. "It's a very grim picture," Guiteau said Sunday. "Things certainly are getting no better."